This month I have mostly been playing with sculptamold… and I quite like it! For those who might not know, this is a mixture of plaster and mashed up bog roll. You mix it with a bit of water to ‘cottage cheese’ consistency, and apply it over the land forms to give a nice solid and fairly light top coat. Basic landforms in insulation foam. Station will be in the foreground. First covering of sculptamold on the embankment behind the goods yard. Extra foam packing behind the bridge wing walls. The sculptamold is very easy to apply, though in my cold/damp garage it took several days to dry instead of the advertised ’30 minutes’… Still, that gave lots of time to smooth out paths, and subtly carve in small rock faces etc. Once dry, it’s painted with a generic brown colour (from the ‘reduced’ shelf of B&Q!). I may redo this step with some added earth scatter to add some micro-roughness before grassing. Painted sculptamold next to the overbridge. Overall, pretty impressed with the sculptamold. 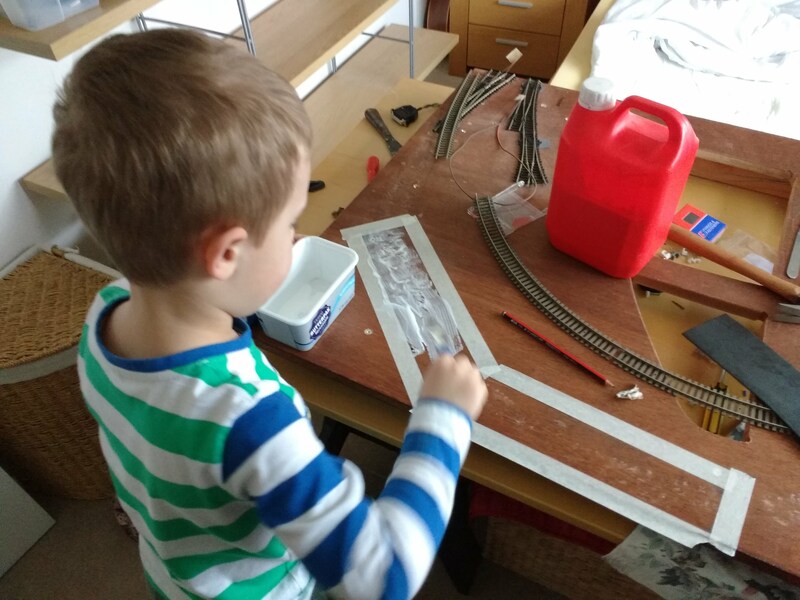 I bought 3lbs of the stuff from Amazon for about £11 – relative expensive per unit volume, but I don’t need very much for the kids’ layout, so not worth the hassle of trying to home brew an alternative. 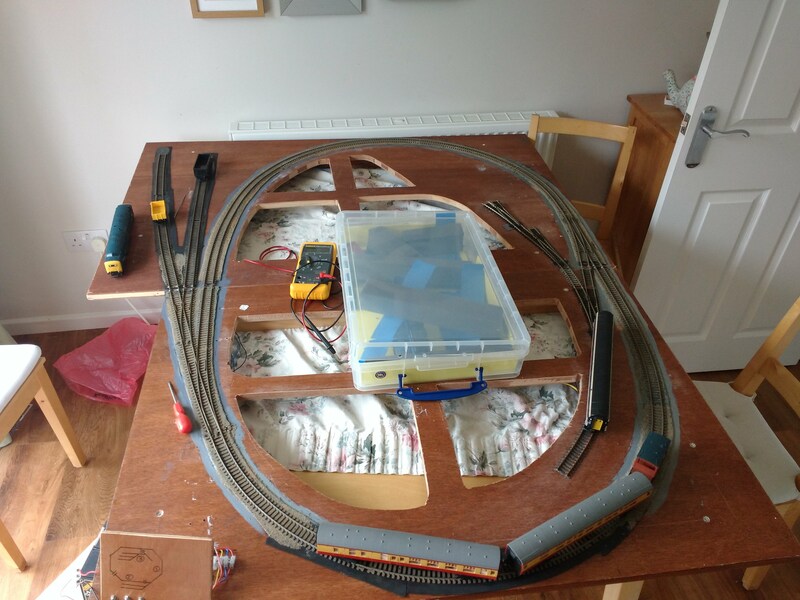 I think I will need about 6lbs to cover the ~5x4ft area of this little layout (with lots of hills). Nice to feel I’m progressing with something at least, though I do also have a slowly lengthening line of wagons to go into the paint shop at some point. Been rather distracted from Junction Dock for the past few months. The kids (yes, definitely the kids, for sure it was the kids) wanted a roundy-round to whizz trains around. I made a simple loop on a pair of old doors last year, but time came to make something a bit more involved for them. The baseboard only measures 5×4′, made up from two old blockboard doors. I can really only fit a single loop using 2nd radius curves into the space. 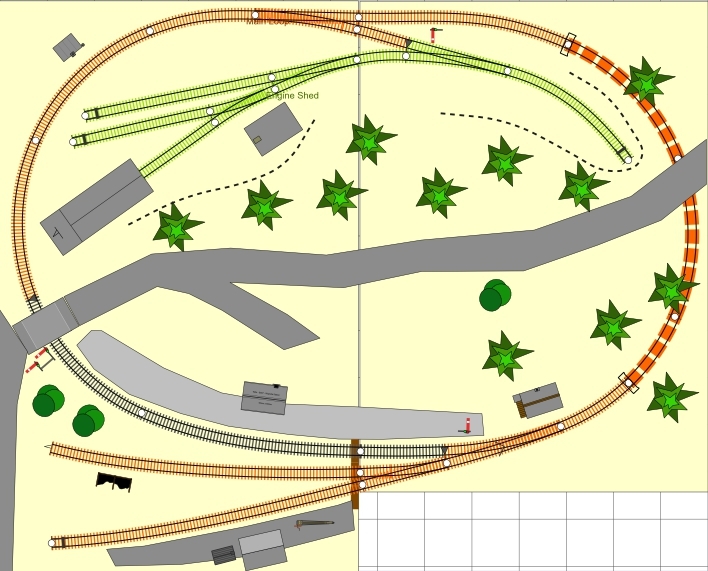 The plan uses the classic two-sided approach; a station + small yard (roughly based on Rannoch station) on one side, and a shed (roughly based on Kyle of Lochalsh) on the other. I’ve always liked the west highland 🙂 The two sides are split by a bridge and – utterly fundamental – a tunnel. 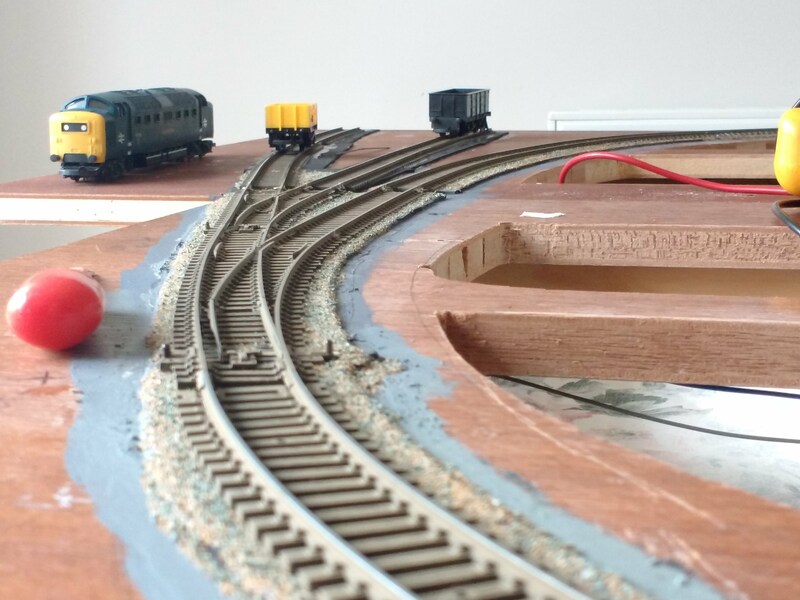 The road up the middle of the layout will run up a hill, providing some kind of separation between the sides. There are no passing loops or storage sidings — but it’s a rather small space! I put a layer of ‘fab foam’ (~2mm thick high density foam) under the track bed — but this didn’t seem to make much difference to the sound insulation properties. I thought with a 1″ thick board, it should be OK — but it seems not. Mind you – there is a very noticable difference between my newer locos and the 30+ year old lima deltic doing most of the work! The kids don’t mind the noise at least! 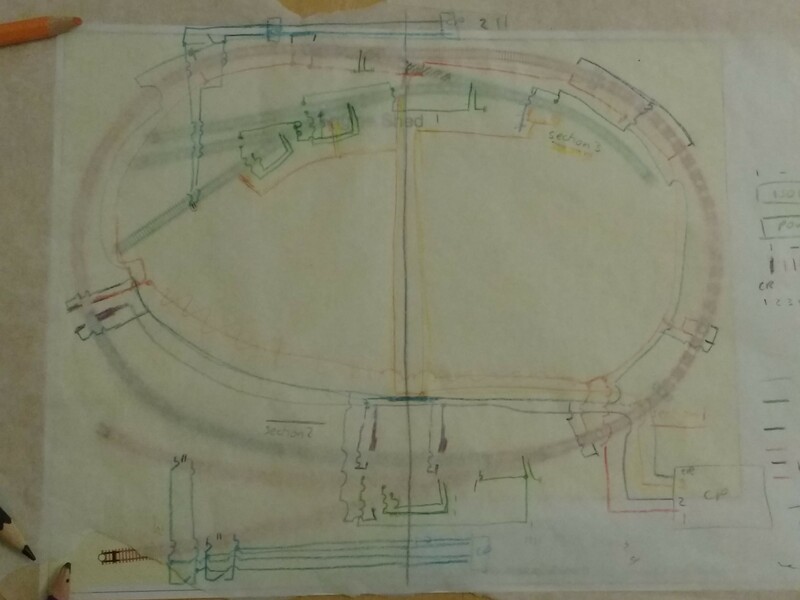 The track was layed down on a bed of PVA (also tried copydex, with little difference), and ballasted at the same time (ala Soloman/Norman). It at least gives an indication of a ballast shoulder, and is a heck of a lot quicker than applying the ballast afterwards. 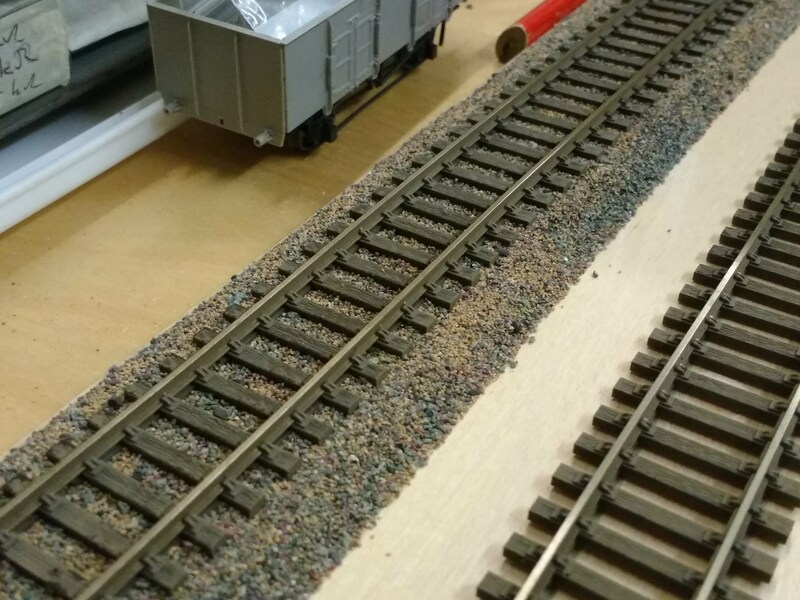 I think though it doesn’t really give a deep enough ballast for the thick peco sleepers. The track was sprayed with Humbrol earth brown (#29) before laying. It needs a bit more finishing now it’s down. Lima Deltic “Royal Scots Grey” peaks through the tunnel… still performing – albeit noisly – after 30+ years!